There was an awesome article in the Sunday Times Culture supplement, about blogging (15.02.09). It highlighted what it believed to be the 100 best blogs, which are all worth a view. No Life in the vertical wasn’t one. 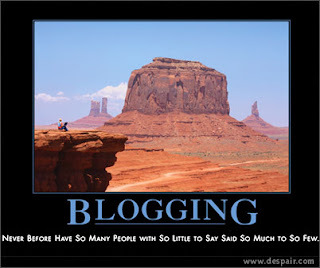 However the introduction to blogging by Byran Appleyard was an interesting overview of what blogging is and isn’t. Unlike say a forum, the blog offers more one way communication or broadcast, in mine I offer my points, opinions or observations and then people choose to read it or not, and if so taken add a comment to the post. Now I very loosely base my blogging on climbing, however it also has a North Wales theme and more specifically Llanberis and me. He goes onto argue that whilst ‘official blogs’, or blogs with large teams of writers, you could argue that UKC fit into this description, as they are more or less aligned with a print media model of having an editor, etc… are generating blogging type content but are in it for generating marketing opportunities that can be turned into cash to run the business or act as cheap and easy advertising in return for sponsorship. Bryan argues that people like myself the ‘inde’ blogger do it for that ‘intimacy and exposure’, and may be he’s right. I also run my blog with adverts and links to my Amazon shop, in an attempt to make some pocket money from my ramblings. I am sure a few blogging traditionalist would have a thing or two to say about that. At the end of the day my blogs are there for people to see who I am, what i stand for and how I interpret the world through words and images. I actually enjoy my ramblings, and I have a small following, half the people I suspect are friends wondering what I am going to rant on about next and the other half there lawyers wondering how badly I am going insult, defame or otherwise upset people. I guess I suffer from the Private Eye effect, in an attempt to have fun I end up occasional upsetting people. The article did make me question what I write and the nature of a blog. At its most basic to me it is opinion, and in particular mine. Now several weeks back Jack and Pete suggested a few tag lines for my blog when I was in the pub, and at first I was taken aback, however I soon realised that there observations of my observations were bang on the nail, in that I often fly close to the wind, which in a close community like climbing and North Wales can lead to the burning of bridges. However this ain’t UKC, its my blog, I more often than not allow any comments past positive or negative, as my opinions are often bi-polar to others. I have changed posts for factual accuracy when these have been highlighted. I have also offered apologies, which i am sure I will need to make again and again in the future. The problem with offering an opinion is that at times it will differ from a some people, am I deliberately play devils advocate, often not, but I do have an ability to detach myself emotionally from my writing and opinion. Often I won’t see offence until it is pointed out, probably due to my rather twisted sense of humour. What a blog is and what people need to accept them for is an instant realise mechanism for the author. They are The Daily Mail of the information super highway world rather than the Times! As Bryan points out they are strangely addictive but above all they are nothing without asmall readership, like yourselves. Overheard in New York – Should add a few of these for Llanberis? Passive aggressive notes – mainly just aggressive! Runs From Camera – Strangely Addictive – One rule set self timer to 2 secs and run.